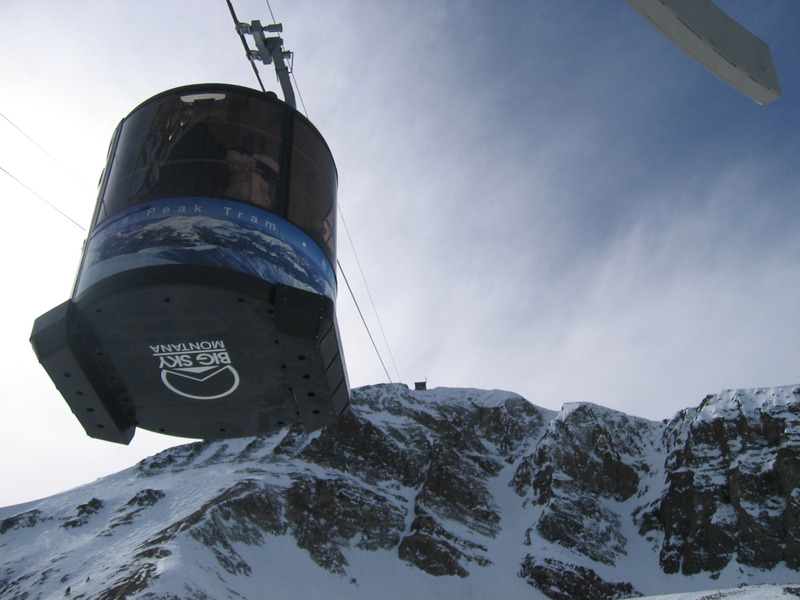 Click here for a lift map of Big Sky. Some friends and I skied in Big Sky, Montana, in March of of 2005. Below are some pictures. 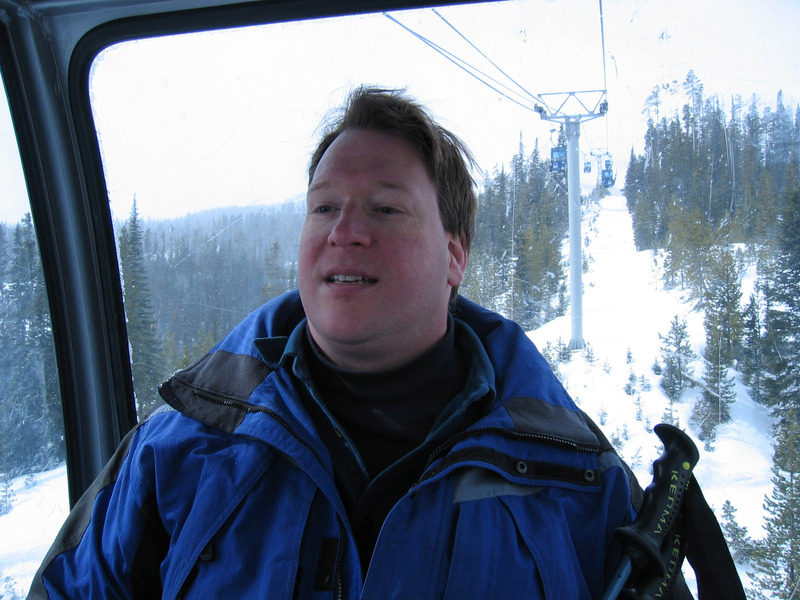 Click on any picture for a much larger version. 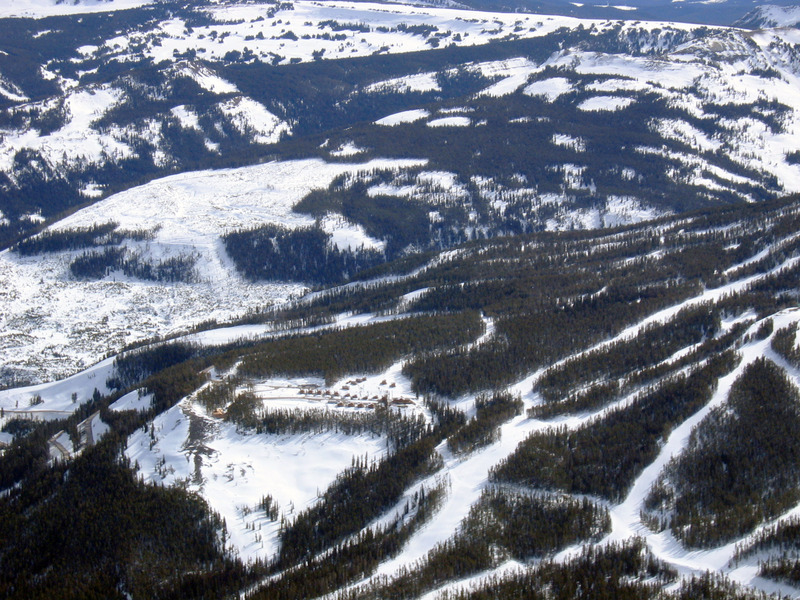 The very top of the mountain is at 11,166 feet, the base lodge is at 7,516 feet (so 3,650 feet of vertical). 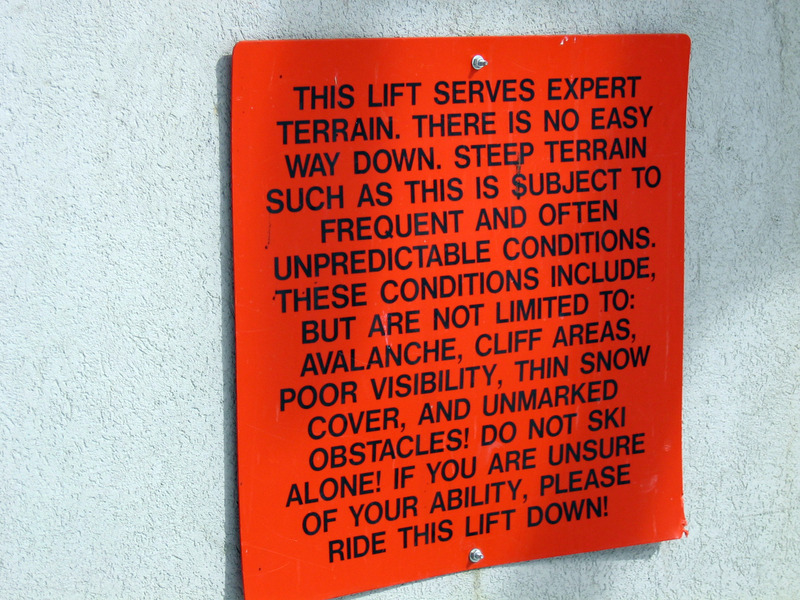 Click here for a lift map. 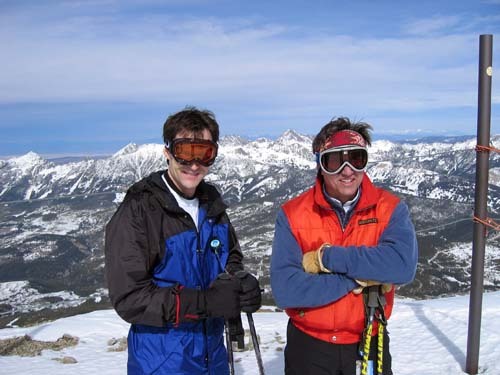 Here are Brady and Garth in the morning of the first ski day (Friday, 3/11/05). Brady, Garth and I (Brian) were the only ones there for this day of skiing, we skied the "Big Sky" mountain. 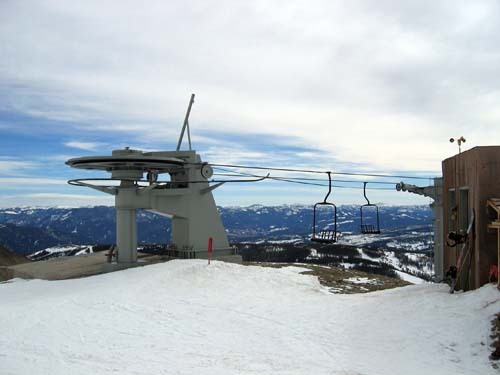 Top of a 2 person chair at Big Sky, it looks like a bomb shelter. 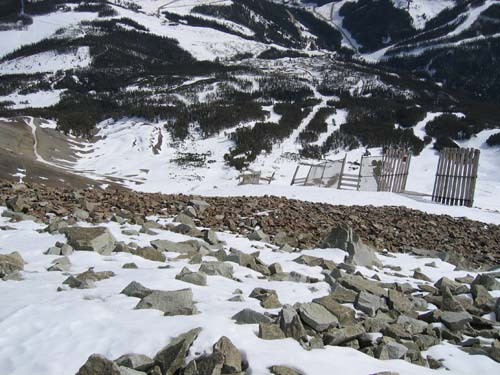 Panorama with Brady on the left looking down the mountain. Above Brady's head you can see the main peak at Big Sky (we went up to the very top of this peak later in the day, pictures below). Be sure to use the horizontal scrollbar to see the rest of the panorama. 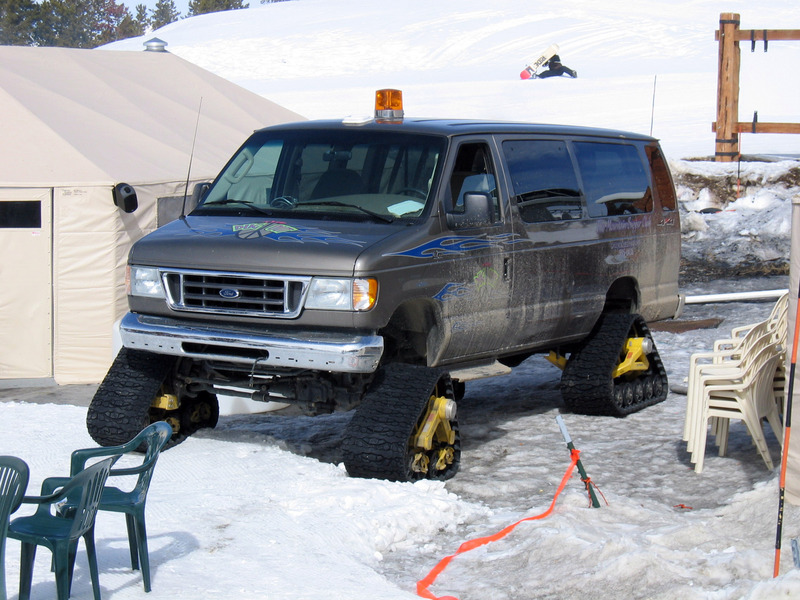 At lunch, we noticed this interesting van, neat tracks for tires! 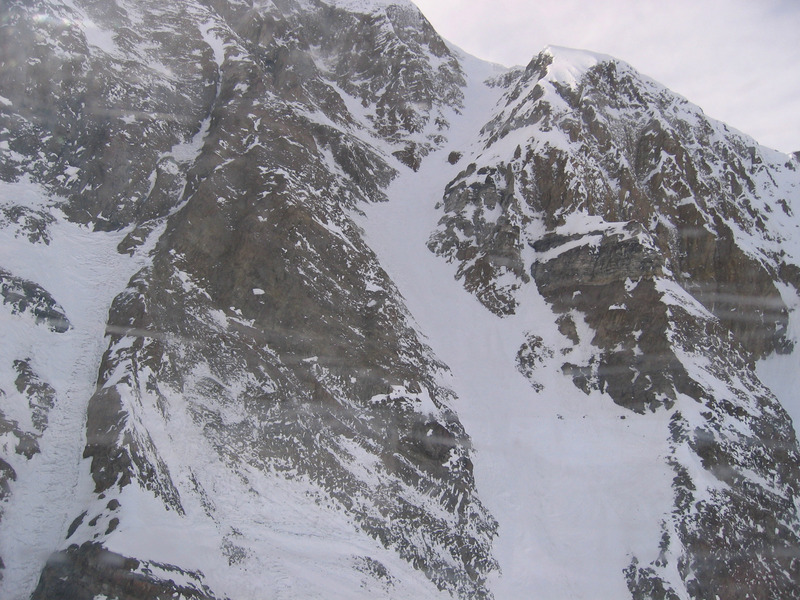 Picture of the main peak from a long way away. 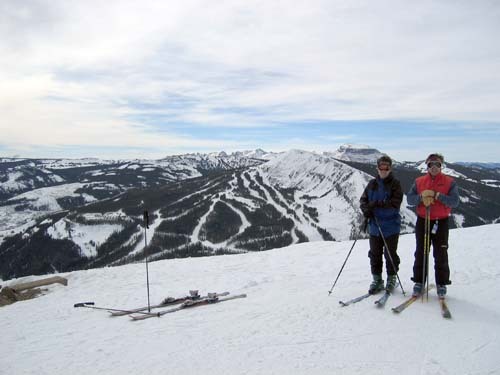 Garth on the left, Brady on the right, on our first gondola ride at Big Sky (early afternoon). Picture of the base area from the gondola as it leaves the base area. 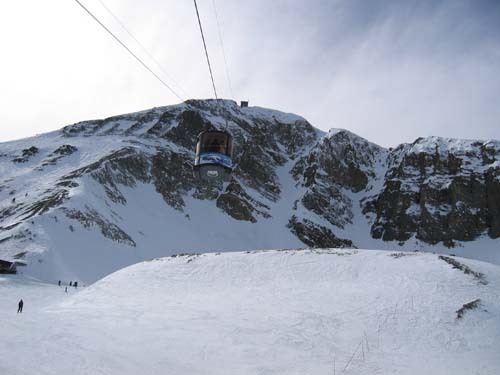 The tram leaves the station heading for the top. The tram is a little farther along. Now we are taking our turn, riding up the tram. 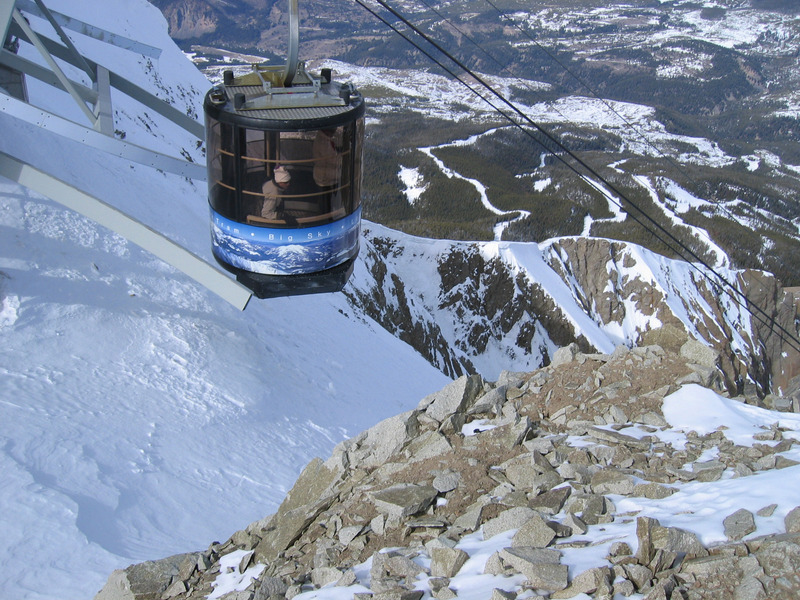 This is a close up of the chute you can see in the picture above to the right of the top of the tram. The chute is called "Big Couloir", and is almost 50 degrees and 2,000 feet long. We saw two people skiing it this day, and it made me sick with fear just to watch them. 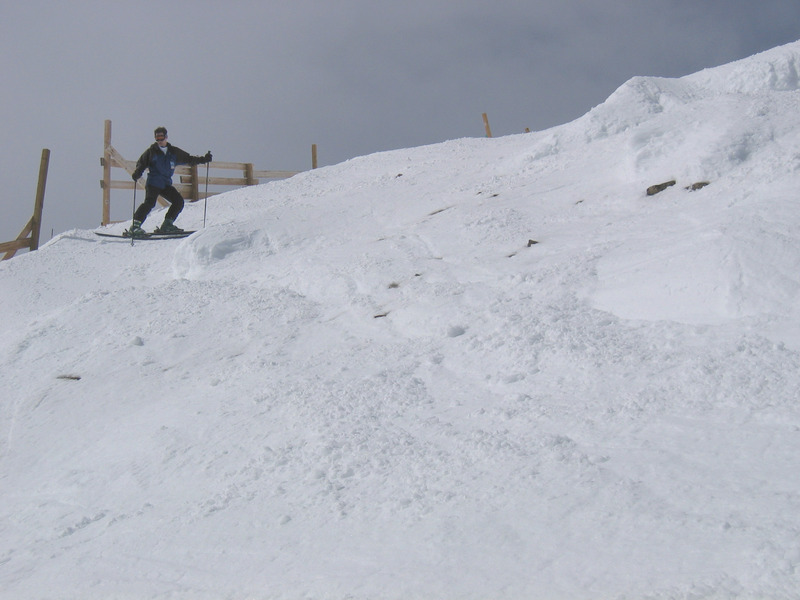 The snow was crusty hard-pack, and one slip at the top and these guys could very well die in the fall. Here is the tram reaching the top of lone peak. 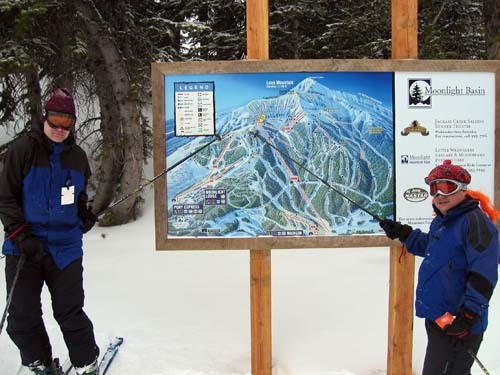 Brady and Garth at the top. This is the view from the very top of lone peak 11,166 feet up. Use the horizontal scrollbar to pan across. Also, click on it to get a HUGE version. 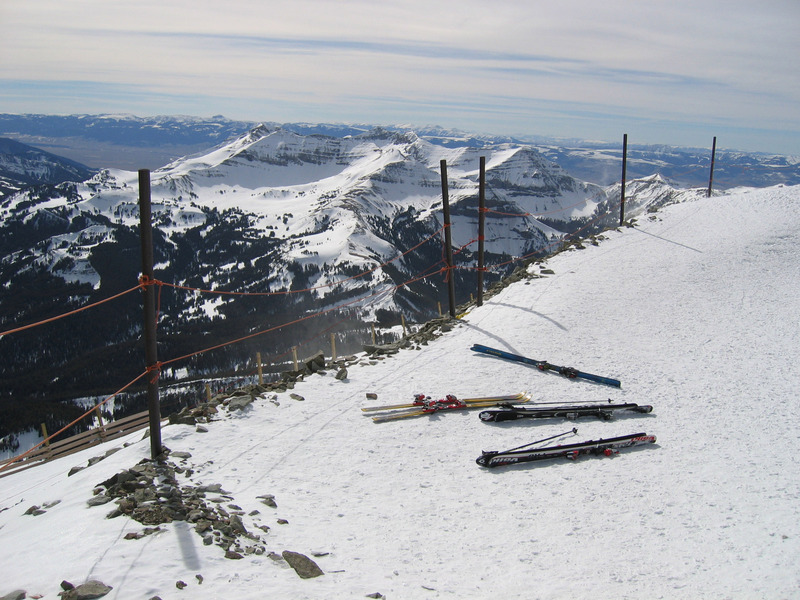 This is a view looking backwards from the top, with our skis in the foreground. We are about to drop off that edge to the left. The very center of this picture you can see a row of log cabins. That is the "Yellowstone Club", which is a "private ski/golf" place, where you buy a membership for as little as $250,000 but you also must buy a cabin which starts at around $750,000 so the general rule of thumb is the membership starts at about $1 Million. 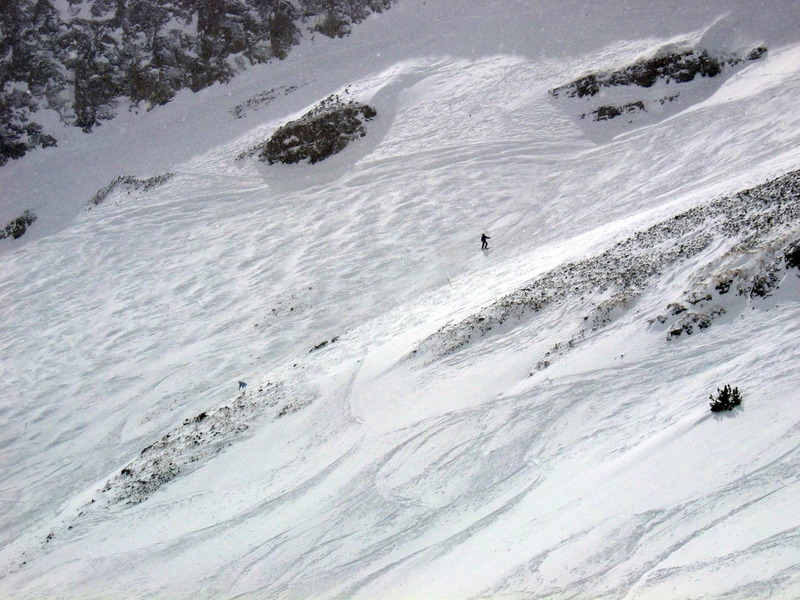 On the back side of the very top of Big Sky (Lone Peak), this is Brady navigating a mine-field of rocks on a black diamond run. The next day (Saturday, 3/12/05), Mike Chow joined us, and we got up and skied Moonlight Basin. 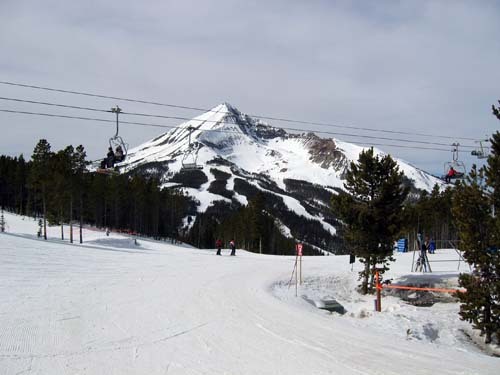 Moonlight Basin is a ski resort that is RIGHT NEXT to Big Sky, in fact both ski areas share one common lift called "IronHorse". 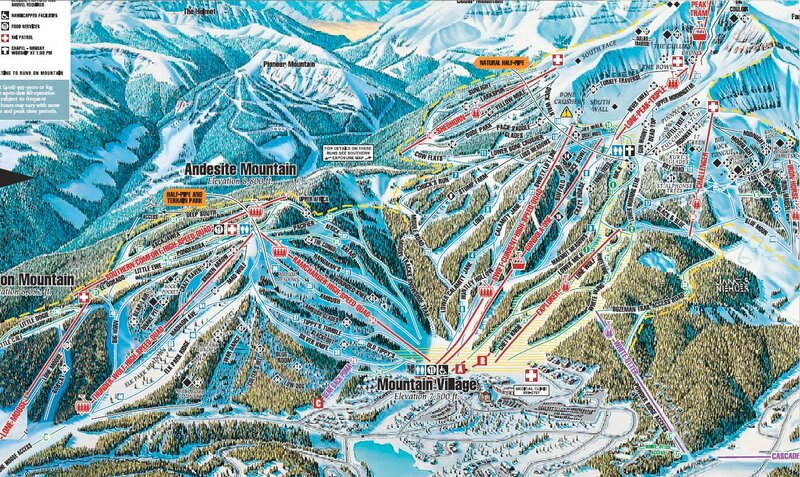 We had a really nice time at Moonlight Basin, we all felt the snow was better, the employees of Moonlight were nicer and more helpful, the lift tickets were cheaper ($35 instead of $61 at Big Sky.) 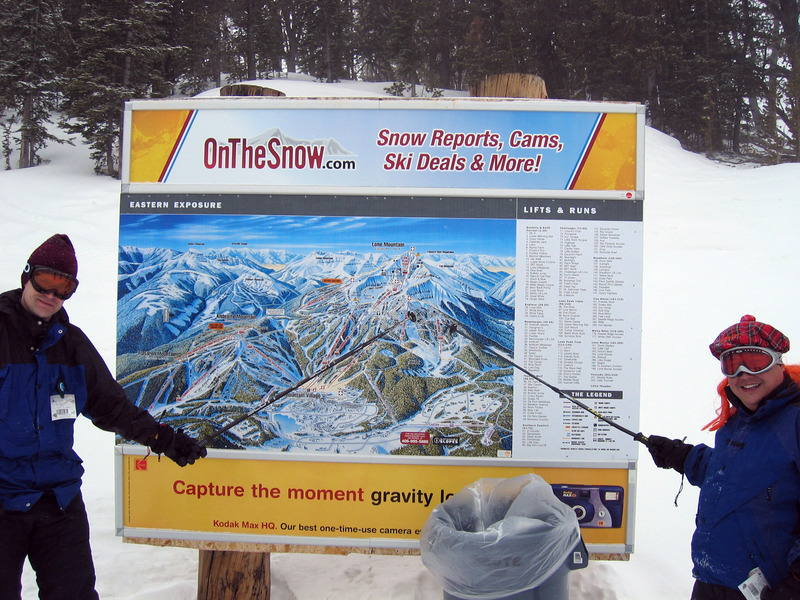 Below are Brady and Mike standing on the Big Sky side pointing at the IronHorse lift. Here Brady and Mike are standing on the Moonlight Basin side pointing at exactly the same lift (but on the Moonlight Basin lift map). 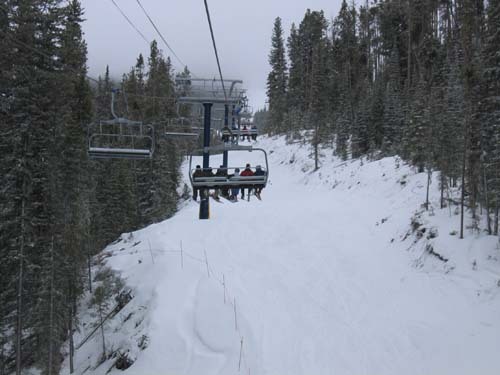 Moonlight Basin has a 6-person lift called "6-shooter". Here we are looking at the 6 people in front of us. 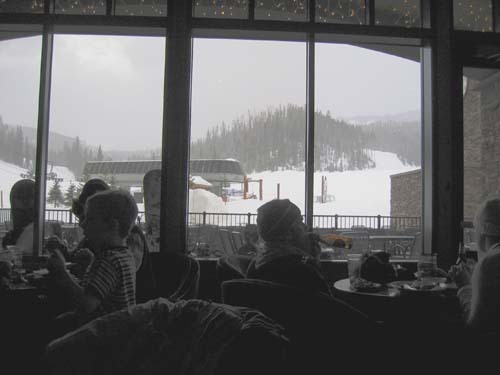 At lunch in the Moonlight Basin main lodge having lunch. 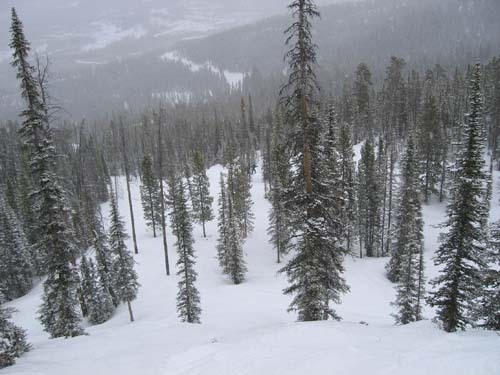 Moonlight Basin is FILLED with runs like the one below, beautiful little gladed roly poly hills and bumps through the trees. Tons of fun! 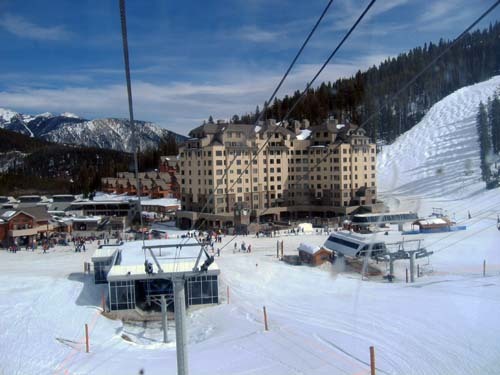 Moonlight Basin is very new, it just opened in December of 2003. The runs were cleared into these huge piles of brush like the one in the picture below. 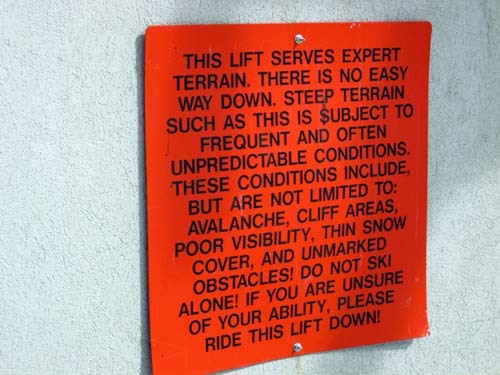 These are all over the place at Moonlight. At the end of the day, we skied back home to our slope side condo at Big Sky. Here we are in the bar looking out at the lift area which has just closed. 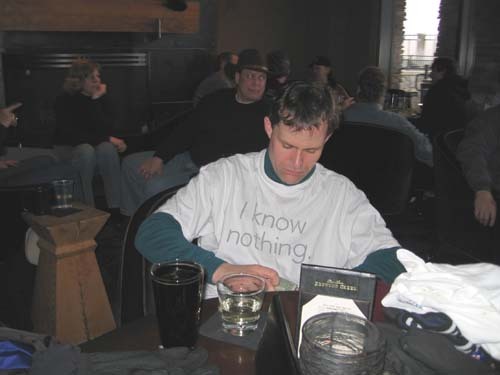 Brady wearing his MailFrontier "I know nothing" T-Shirt. 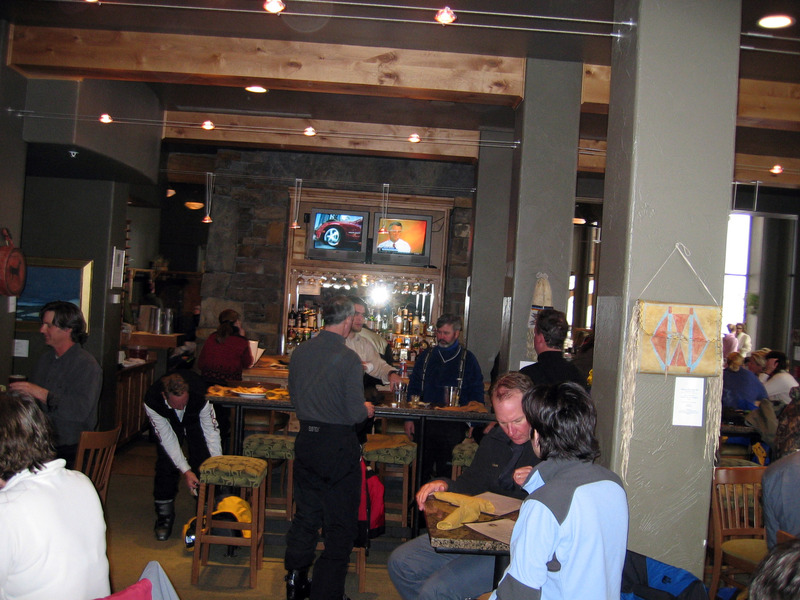 Looking out the bar onto the closed area. Small story. 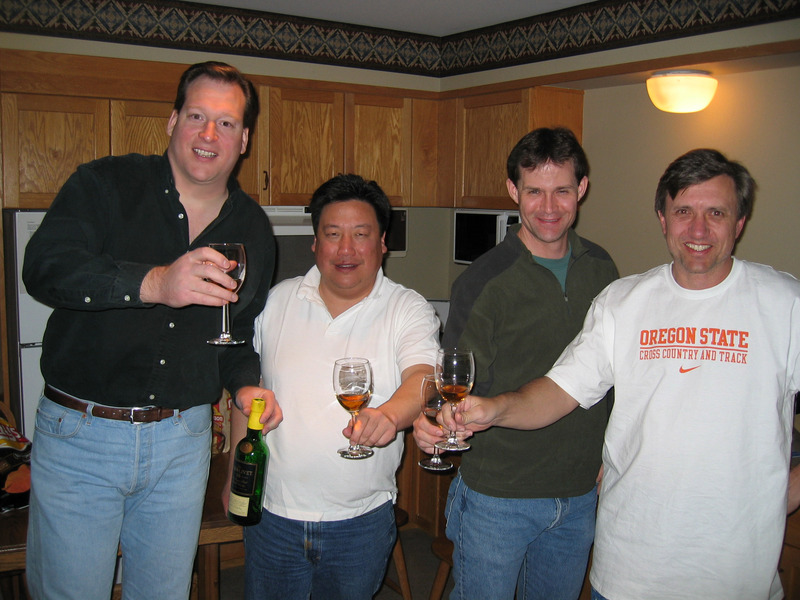 In December 1997 when 4 of us were visiting Aspen, Colorado, we bought a bottle of scotch we only open when we're all together. 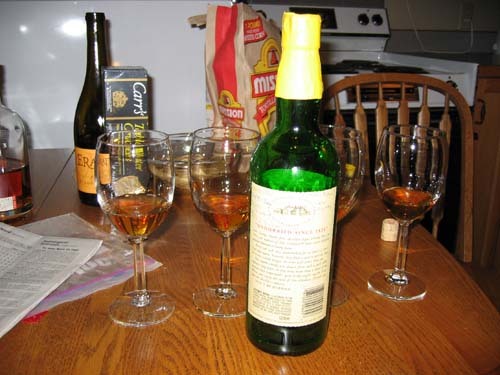 The bottle was finally finished on this trip, it is pictured below with the last 4 glasses of scotch. 3/11/05 - Big Sky, Montana (the website you are reading is all those pictures). Below are the four of us. From left to right: Brian Wilson, Mike Chow, Brady Nilsen, Garth Eliason. This is the last of the scotch we bought in Aspen in 1997 that we only open when we're together (6 times over an 8 year period). 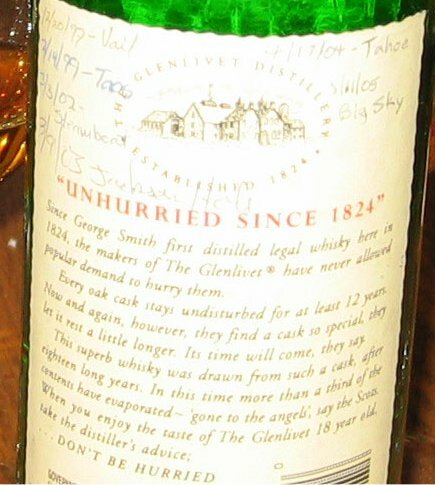 The bottle was Glenlivet 18 year old scotch. 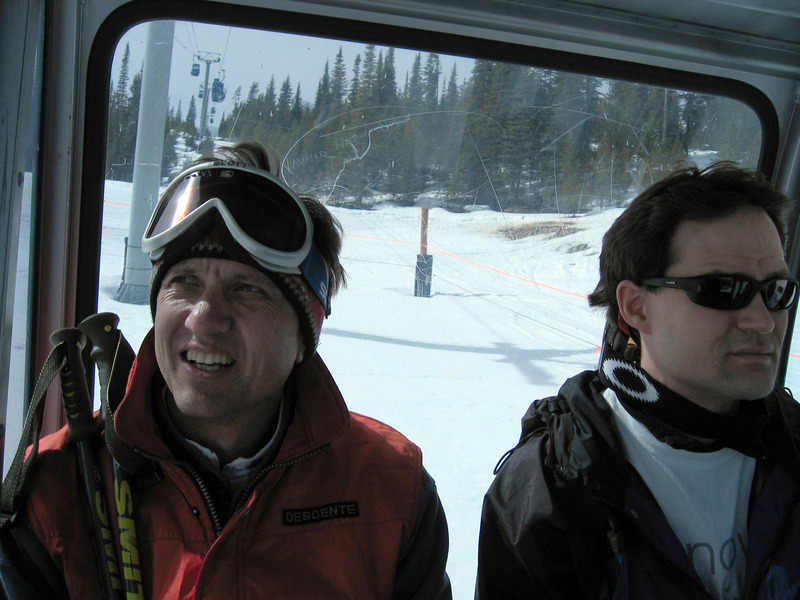 On the last day of skiing (3/13/05) Brady, Mike and I skied the first half of the day, then Mike left and Brady and I finished out the day. This next picture is a panorama of the bottom of Big Sky. This is the "base area". My first ride up in the gondola after a couple of hours of skiing, Brady took this picture. In the next panorama, you can see Lone Peak disappearing into the fog, and the generally gray day it was. At the end of the day it started dumping down snow and so Brady and I finished out the trip on some pretty nice snow. 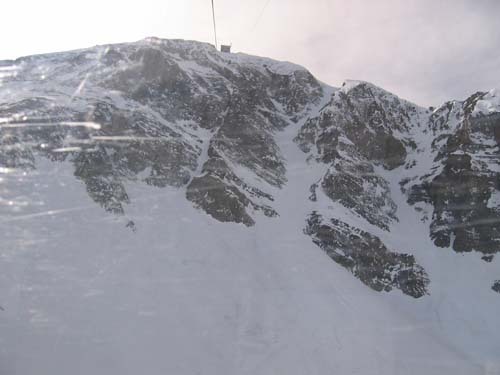 You can see Brady off in the distance on the big wall. The morning of 3/14/05 Brady and I take off at 5am for the airport. 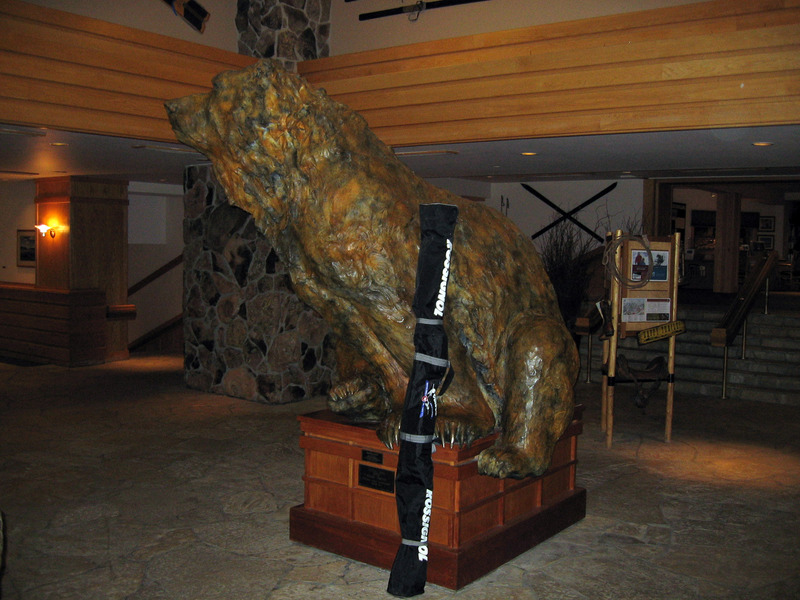 Here's a picture of the Huntley Lodge lobby with a really huge metal bear with Brady's skis so you can see how big it is. Below is some info I collected together putting the trip together. I include it here just as random notes to preserve them. 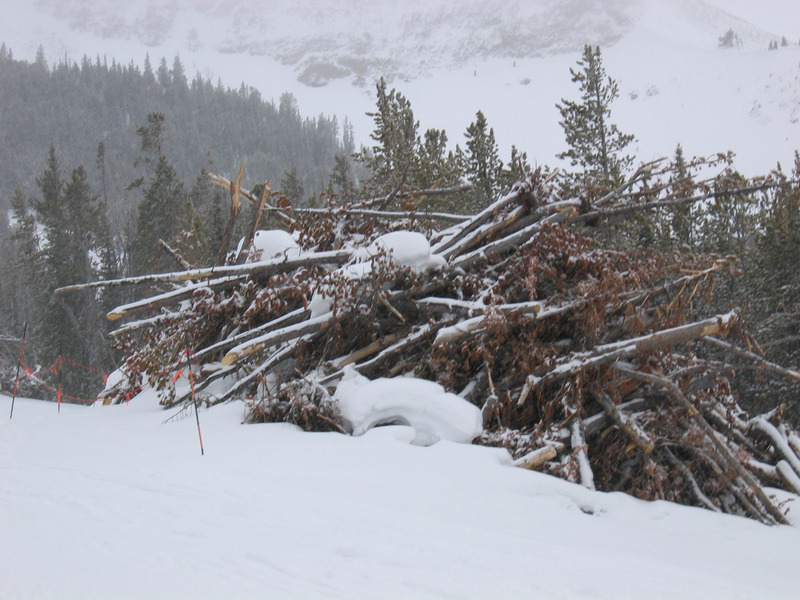 Click here for a road map from the main HW 191 to Big Sky.